I’m barely squeaking this post in! 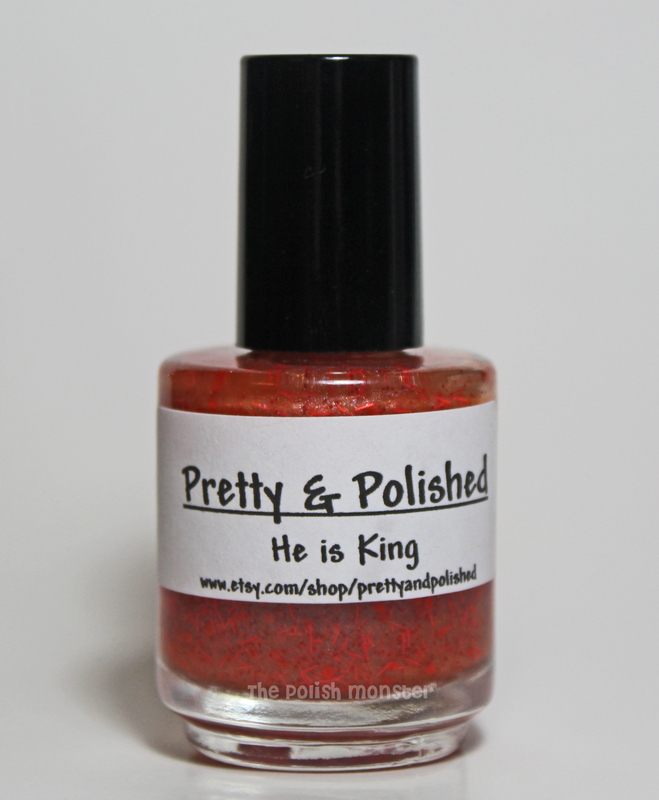 So in honor of it being August, I’m showing off He Is King by Pretty and Polished for today’s Indie Wednesday! For those that don’t know, Chelsea has been releasing a zodiac polish just about each month for each sign- beginning with her own sign, Taurus. This is Leo’s polish! Leo’s zodiac sign is the lion- hence the orange fur look to this color, along with the ‘King’ reference! To start off with, I used 1 coat of Sephora’s Drama Velvet Pearl. I picked this up just the other day on clearance for $3. I’m not usually a huge orange fan, but I loved this one! It applied beautifully and was a 1 coat polish, which is always good! It also has a really pretty golden shimmer in it. I followed that up with 2 coats of He Is King. Ignore the little chip on my thumb (now that I’ve drawn your attention to it), I took pictures after wearing this for a full day! I’ll be honest- I usually hate bar glitter. Initially, the only reason I bought this one is because I have the entire collection. But I’m so glad I did! Especially over orange, the orange bar glitter gives the polish a neat effect- fur without the fur 😉 There’s also orange hexes of the same color, and a fine deep red color glitter along with an overall brownish-orange shimmer base. As always, the best place to keep up with Pretty & Polished is on her Facebook page here. She sells through both Etsy and Llarowe, but you’ll be updated on restocks via Facebook. Be sure to check them out! All of her zodiac polishes are fun and very fitting! This entry was posted on August 8, 2012 by The Polish Monster. It was filed under Uncategorized . I’m not sure how I feel about this one. It’s just not my color faves I guess. Looks nice on you, though! A lot of people have said that 🙂 I think it’s a love it or hate it kind of color! I was suprised I really liked it, but it’s more of a ‘fun’ color than an every-day wear sort of thing.